There is only one word I need to say to describe how I am feeling: Friday. I am so happy it’s Friday as I always am. This week was absolutely exhausting and I’m thrilled it’s the weekend. We have some very fun plans for this weekend with friends and family. But before I jump ahead, I will back track to yesterday. I am getting so completely bored with the low-fiber foods I have needed to be eating as of lately…Cream of Wheat, bananas, sweet potato, chicken, rice. It’s becoming very boring boring boring. This can’t last too much longer because I am going nutso. I am trying to continue to be creative with my options, but it is very challenging. 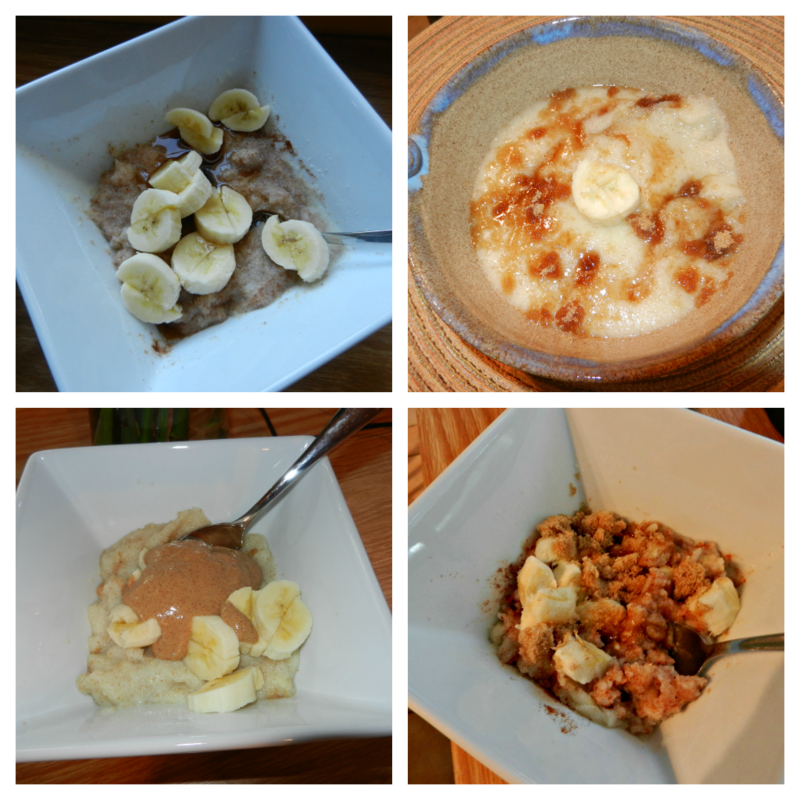 I thought I could at least make the monotonous breakfast look pretty by putting them into collage form. Cream of Wheat. Oooo Ahhh. And yes, this is what I had yesterday morning if you couldn’t guess. 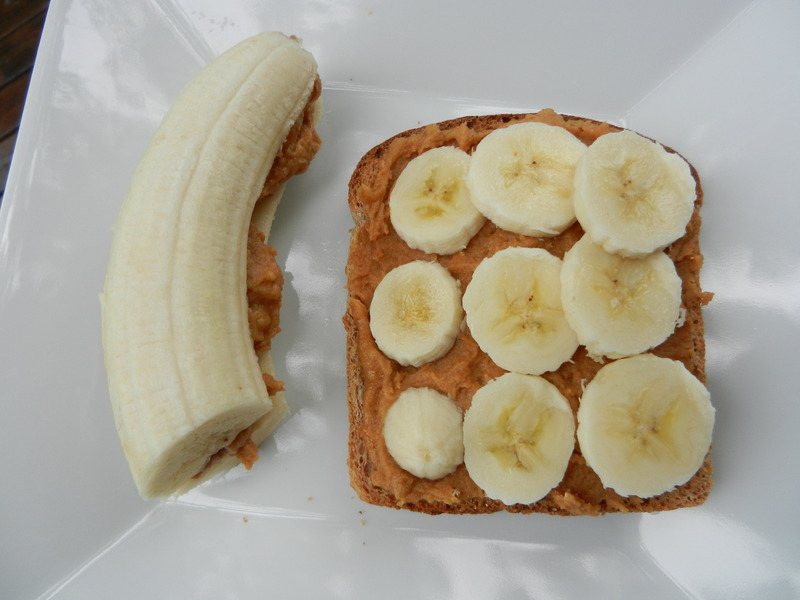 A tried and true lunch of mine, banana and peanut butter has continuously been making its way into my diet. 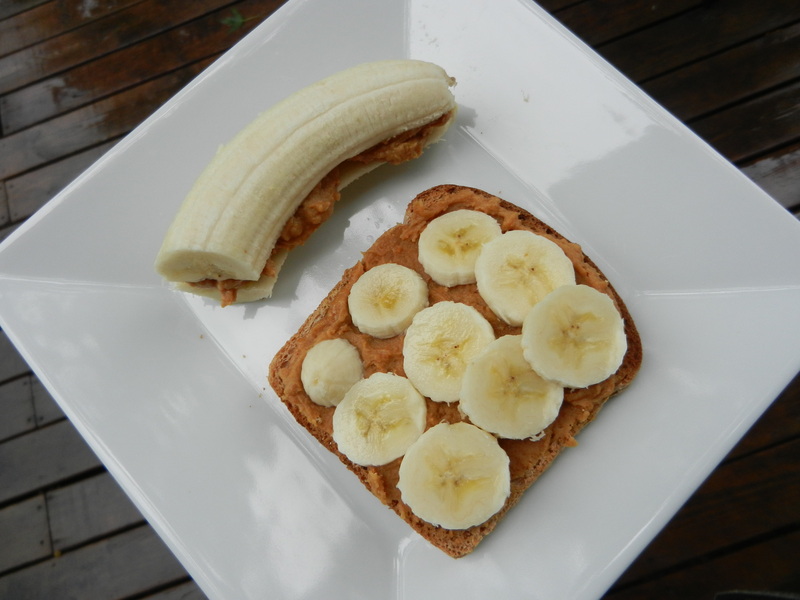 This is one combination I don’t think I will ever get tired of. At least I hope not. It’s a beautiful thing. It’s like they were made for eachother. During lunch break, I decided to conduct an experiment. 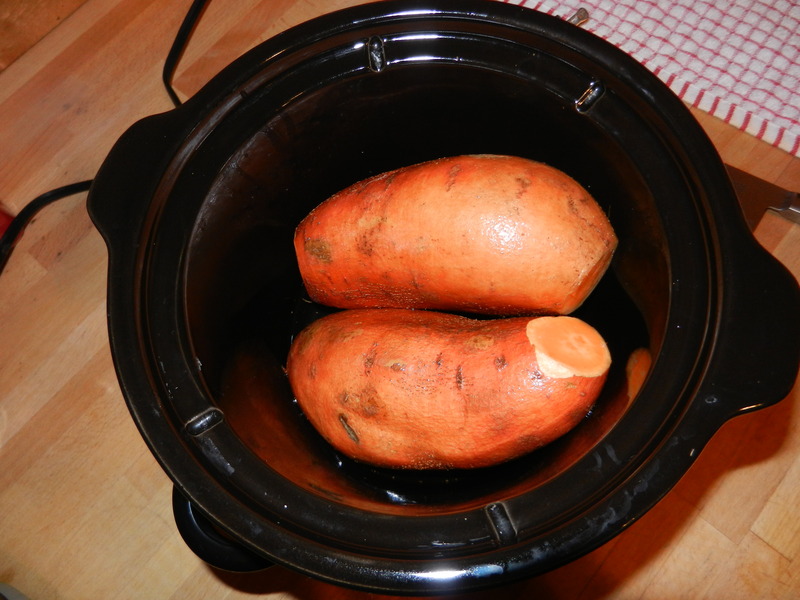 I wanted to know if whole sweet potatoes would cook properly, and stay moist, if cooked in the crock pot. 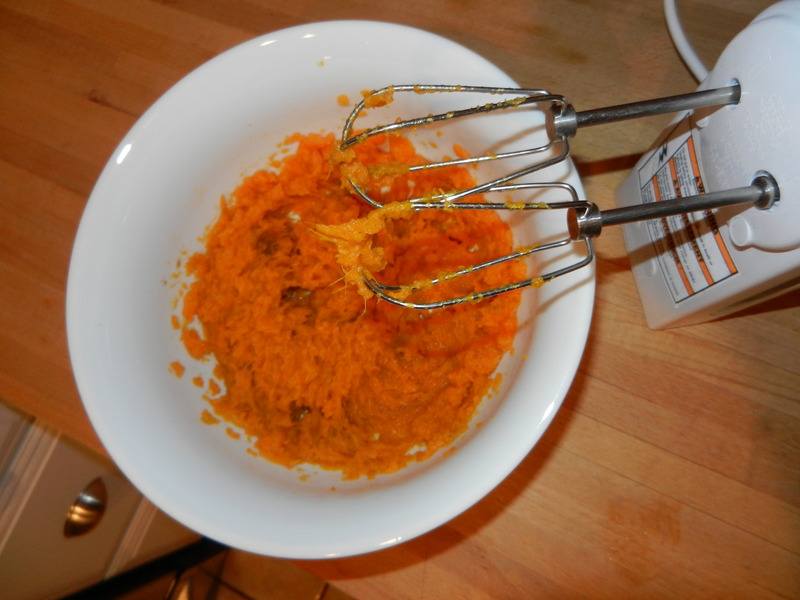 I am getting tired of eating baked potatoes and sweet potato fries, and was in need of something new; a new way to prepare the sweet potato. I hypothesized that they would cook perfectly in the slow cooker just as everything else does. I swear that machine is magic sometimes. 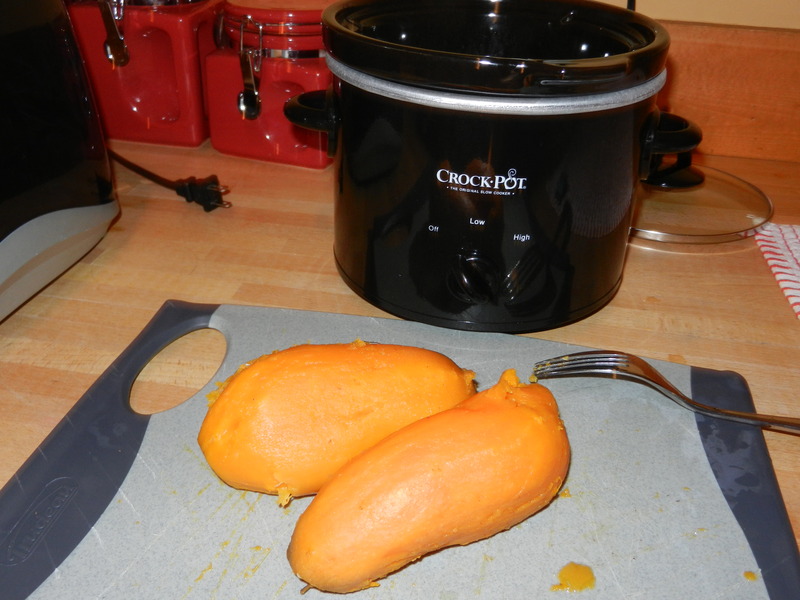 I scrubbed up two sweet potatoes and placed them into my mini crock pot. I added two cups of water, covered, and set on low for the afternoon. 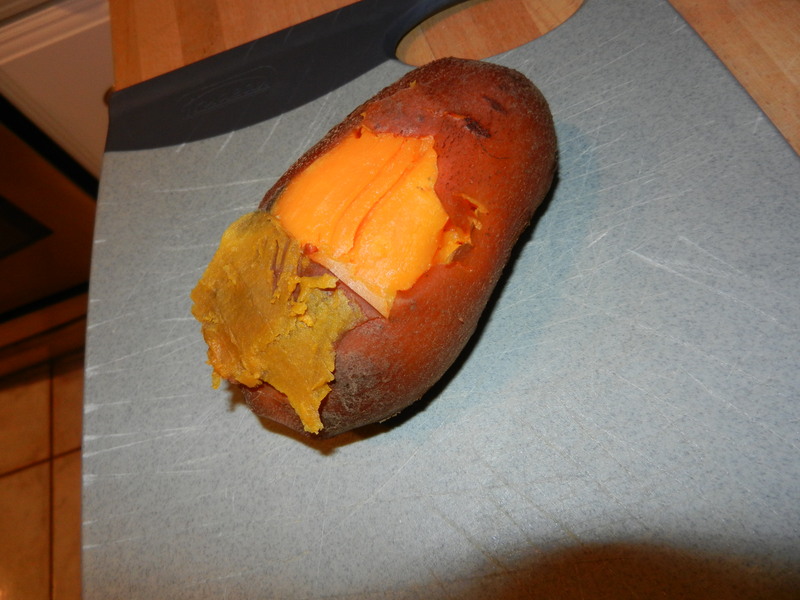 About 6 hours later, I removed the sweet potatoes from the crock pot. They were very tender and I was able to peel the skin right off. Now, just a reminder for you all, that normally I would eat the skins, but considering I have to be on the low-fiber kick for now, and the skins hold the majority of the fiber, I had to removed them. 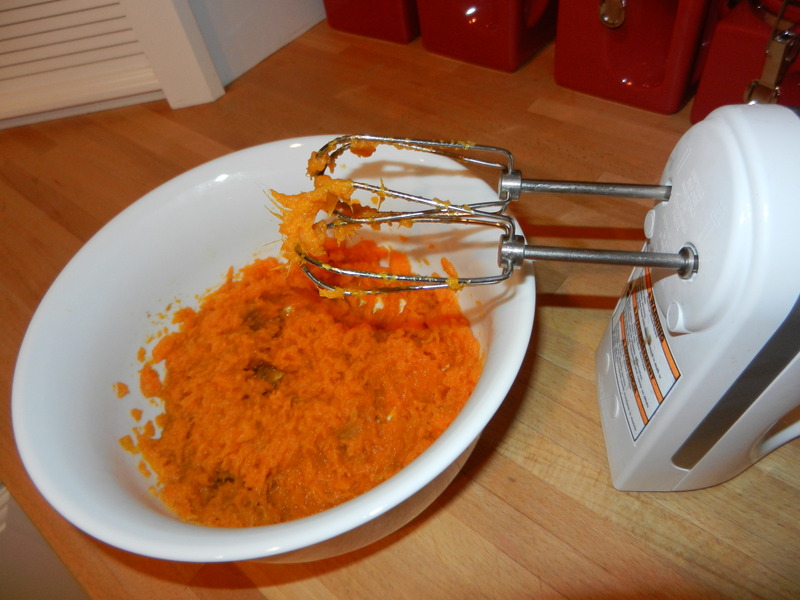 I placed these beautifully orange potatoes into a bowl and whipped them into a puree with the hand mixer. I plated up a heaping spoonful, sprinkled with cinnamon, a touch of ginger, and salt. 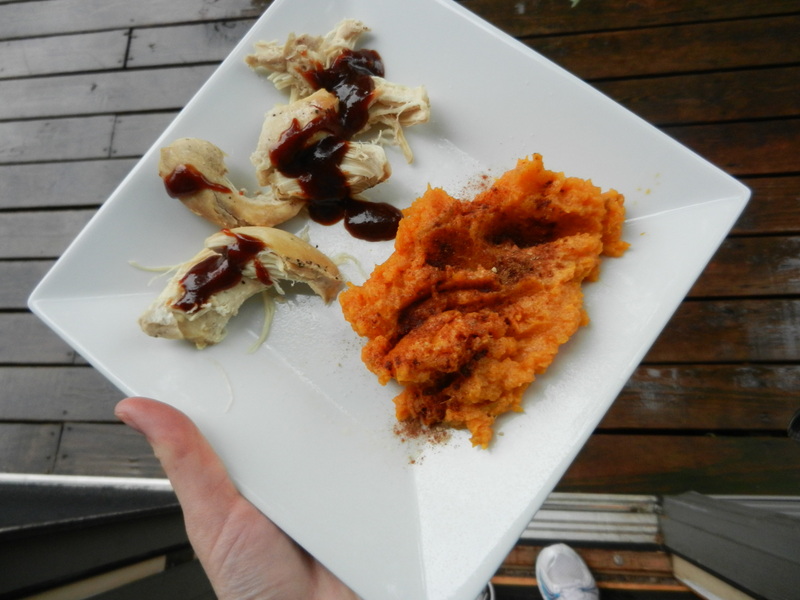 Alongside the whipped potatoes I got my protein fix with leftover crock pot chicken with BBQ sauce. My experiment was a success. I wasn’t sure how the potatoes would turn out being that I just plopped them into the crock pot and let them rip, but they were very sweet and tender and moist and very tasty. Talk about easy peasy right? I would do this again in a heart beat. You could do it with any type of potato. Oh, how I love my crock pot. It makes life so much easier. Yesterday’s day of eats pretty much sums up my current diet. I miss my greens SO much and cannot wait for the day when I can pile my plate high with dark green leafy lettuce and spinach, add a ton of broccoli, beans, and every thing else that I’m not able to eat right now, and just scarf it down. But, if I want to get to that point, I have to stick to the easy to digest stuff for now. I am trying to keep it tasty, but I am losing my gusto for creativity with my options! I did find a recipe for sweet potato gnocchi which intrigued me. I may have to give that a whirl. Since today is Friday, that means it is time to check in on the June Yoga Challenge. I challenged myself to work three yoga sessions into my weekly routine. I didn’t begin the challenge until Tuesday however, and was only able got in two sessions this week (Tuesday and Wednesday). I know that had I had a full week to complete my challenge, I would have met it in a second. Although, I am still contemplating getting one in today. Then I would reach my goal! So, how do I feel after my week one Yoga Challenge? Pretty good. It’s too early to really feel any major differences, but I do notice when I am at work that I am starting to gain better control of my stress when certain chaotic situations arise. I still have a lot of work to do, but I will get there. Question of the Day: Anyone have any fun recipe ideas for me that are low-fiber?! 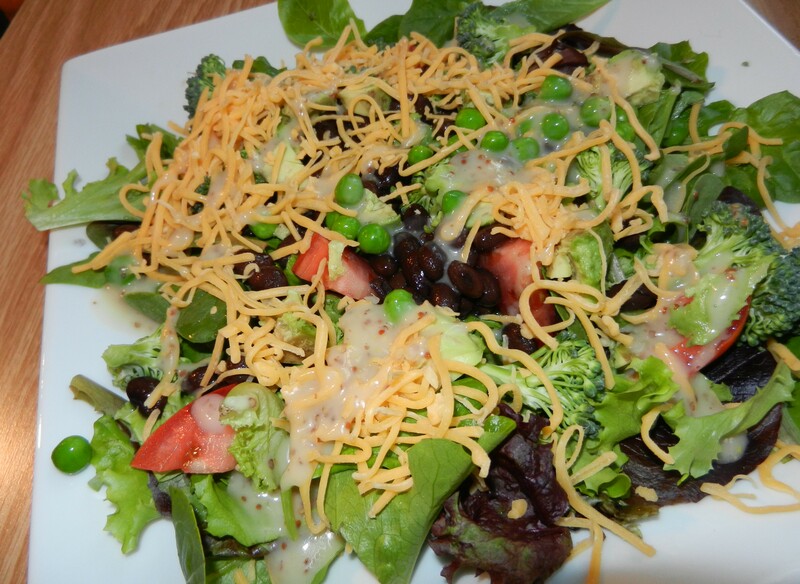 This entry was posted in Breakfast, Dinners, Lunch, Recipes by Melanie. Bookmark the permalink. Starting your yoga challenge on Tuesday and practicing two days in a row is pretty awesome! Hope your able to get in some yoga time today too 🙂 even if you practice for 5-10 minutes it still totally counts! Hi Sarah! I DID get my third session in yesterday so I met my challenge for the week! 🙂 Yay! 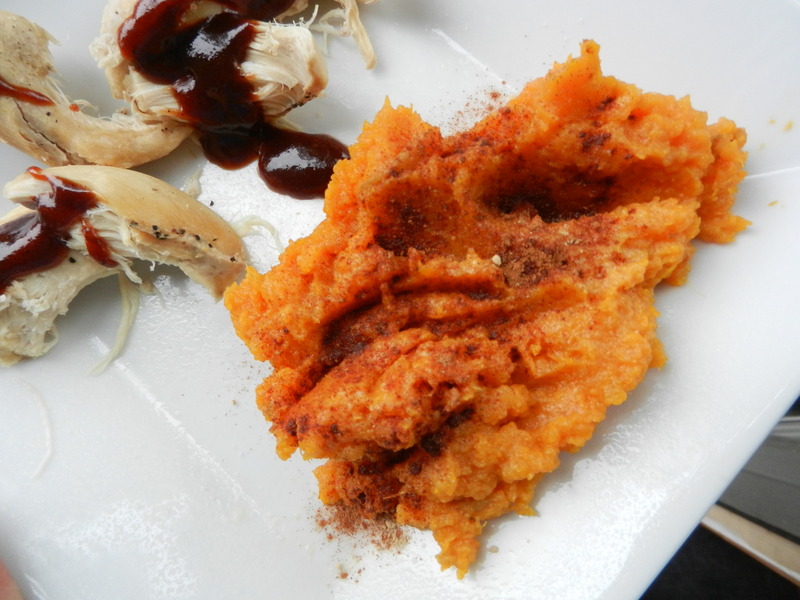 I couldn’t believe how well the sweet potatoes turned out in the crock pot; I swear they tasted better than ever. Thanks for reading! Happy weekend!